If you recall my last blog post, I discussed the matrix organization, and argued that it is fairly rare to find a formal matrix structure these days (despite what some people claim). I have interviewed managers in dozens of firms, and there’s only a handful of them that have had a matrix structure. Even in these cases, it has usually been limited to one unit or one level of the organization (i.e., the majority of employees did not report to two or more bosses). However, I do think that many organizations have a “hidden matrix”. By that I mean that there are reporting lines and governance relationships that are not shown on the organization map, but which you find when you dig below the surface. In several of my projects, I have asked employees and managers (in interviews or surveys) who they need approval from in order to start a project, to procure a product or service, or hire a new employee. Surprisingly often, it is someone other than their unit manager. 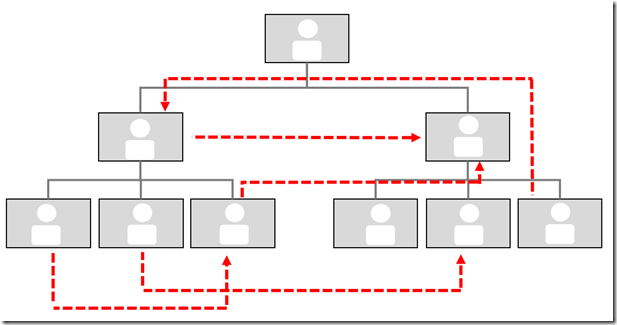 You then get an org chart that looks like the image above: Hidden reporting lines, in addition to the official ones. It is curious because this phenomenon that is not acknowledged by most experts. Pick up a textbook in organizational behavior or organizational theory. What you learn is that formal reporting lines correspond to the official vertical structure, while social networks bind together units laterally (e.g., ensure that people share information and collaborate with each other across units). But we are not talking about social networks across sub-units (or what academics call “informal ties”), we are talking about “formal ties” (linkages to people who can give approval, and thus have some kind of authority over an activity or a budget). Now the question you probably have is, is this really a problem? Aren’t all organizations “disorganized” these days, and aren’t these kinds of crossing authority lines inevitable? But is it an effective way of running an organization? In many firms I have worked with, employees have complained that their roles are unclear and that they don’t know who is responsible for solving key problems. And – I would argue that IF people in the organization perceive this as a problem, and IF its’ a factor that causes stress or reduces productivity, I think we should do something about it. Typically, there are three challenges. 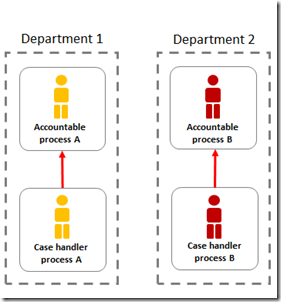 The first is that the hidden matrix creates a difficult role for the middle manager. In one governmental agency that I worked with, employees in one department told me that if they didn’t agree with their line manager’s decision, they could simply involve a manager from another department instead, who could escalate the decision to his or her boss. Secondly, when it is unclear what authority the sub-unit manager actually has, it makes it difficult for top executives to assign real accountability to a sub-unit. There is no longer a correspondence between the actual and the official role of the manager. For example, if it is a manager outside a unit that approves many expenditures, how can you then ask the manager of the unit to take responsibility for a budget overrun? But in some cases, it is even worse than this: The hidden matrix introduces a conflict of interest, or a goal conflict. One example would be an IT organization that I worked with a couple of years ago. 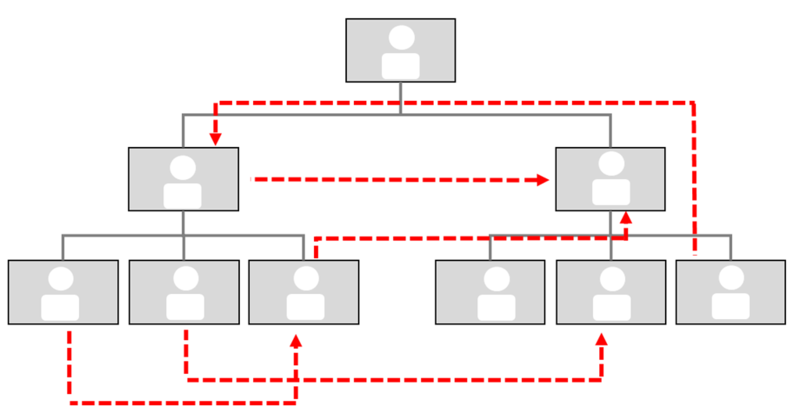 In addition to the departmental structure, the employees had been given different process roles, according to the ITIL framework (ITIL is used in many IT organizations to define roles and processes). After mapping the roles and relationships, we discovered a hidden matrix, as illustrated below (I show only two departments, but there were several). 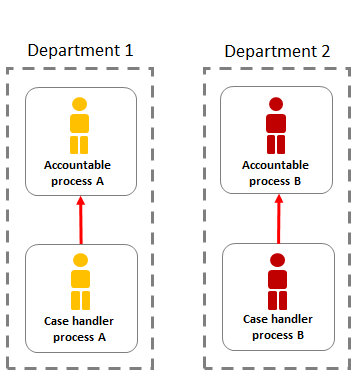 As an example, the manager that was accountable for one IT process (“Accountable process A” in the illustration) would need help from a person in another department in order to perform his/her tasks (“Case handler process A”); but this person would continue working for his or her unit manager (“Accountable Process B”) on other matters while supporting the first manager with Process A. 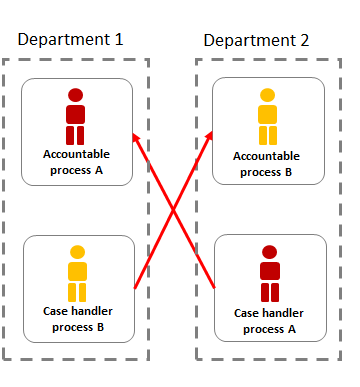 The hidden matrix sometimes led to role conflicts, for example when people in the same unit were given the responsibility both for requesting and approving changes to the IT systems. One may wonder whether there is any downside to such “streamlining” of the organization. Could it lower flexibility, or reduce experience sharing across units, for example? In my experience, I have not seen any negative side-effects. My impression is that you reduce confusion, ambiguity, and politics, and enable people to accomplish the same (or more) with less time or resources. There is one cost, though: You need to spend a bit of time understanding the system and organizing it in a better way. But as I said; an external person cannot be the judge of this: The key is whether the managers and employees perceive the current organization as effective or not. As we experiment with new organizational forms, I think these kinds of challenges are going to be more common. I am all for new and more flexible ways of organizing – but only if it can be done while preserving clear roles and accountabilities. 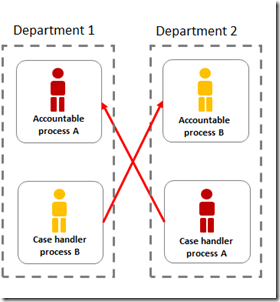 I hear your call for clear role accountabilities – both vertical and lateral. Elliott Jaques defined manager clearly and then defined vertical TARRS – task assigning role relationships, and TIRRS Task initiating role relationships for the lateral accountabilities and authorities. I agree with you that in most organizations – manager is not well defined, vertical accountabilities are poorly defined and the laterals almost not at all. And the word matrix is not clearly defined or used. Some use it to mean reporting to two different managers each of whom can assign tasks and others use the term loosely for all types of lateral accountabilities and authorities whether defined or not. 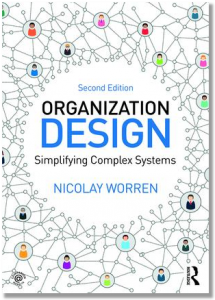 Without clear definitions and clear role definition both vertical and lateral, organizations clearly organization effectiveness will suffer. Just to note – there are powerful frameworks for defining lateral accountabilities and authorities, why not use them.